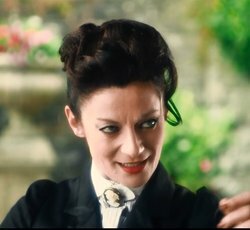 Michelle Gomez is best known to Doctor Who fans as The Mistress, the current incarnation of classic villain The Master. She appeared in teaser vignettes throughout Season 9 with Peter Capaldi and was revealed to be the Mistress in the season finale. She has now filmed episodes for her return in Season 9 to air Fall 2015. And although this is her Doctor Who debut on television, she has appeared in Doctor Who before: in the 2007 Big Finish audio drama "Valhalla" starring Sylvester McCoy as the Seventh Doctor. Gomez was born in Ayr, a large town in Ayrshire, Scotland. She attended Shawlands Academy and trained at the Royal Scottish Academy of Music and Drama. Her first major role was in "The Acid House", after which she starred in "The Book Group", both on Channel 4, a British public-service television broadcaster. She would then move to "Green Wing", a comedy also on Channel 4. Gomez would appear in the film "Chromophobia" in 2005, and star in the film "The Good Housekeeping Guide" in 2005. She starred in "Boeing-Boeing" at the Comedy Theater in London. She would take on the role of Kate in "The Taming of the Shrew" in 2008 at the Courtyard Theatre and the Novello Theatre. From, there, she would star in "The Wedding Video" before appearing that same year in the comedy series "Bad Education." In 2014, along with her appearance in Doctor Who, she began producing comedy sketches for Wildseed Studios on YouTube.